I’ve just realised how hard it is to actually do a ‘fave Christmas movies’ post when you’ve already done one last year. Most of my favourites from last year are still my favourites this year. But I thought this year, I’d include a few different favourites so it’s not the same as last year. Yes, I did include Home Alone again this year but it wouldn’t be a Christmas Film Fave post without Home alone! I’m sure you’ve all seen this one and know what it’s about. But if you haven’t yet, this one is a very Christmassy and festive film where the Grinch aims to ruin Christmas in a town. It’s full of laughter and all things Christmas! This one is one of my favourites because it includes Christmas lights, Christmas decor and so much more Christmassy things. It’s about two neighbours who compete to have the most festive / well lit house in their street. 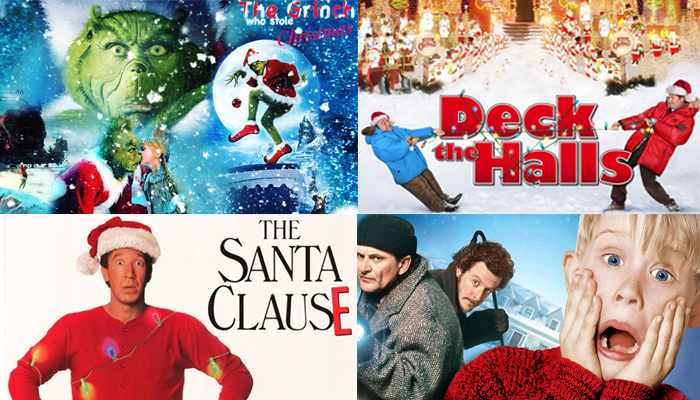 It’s a great family comedy which will certainly get you into a Christmassy spirit. Who doesn’t love the original Santa Clause movie?! It’s a family comedy which is guaranteed to put you in a festive mood. Of course I couldn’t leave out Home Alone. Still one of my all time favourites. I watch this throughout the year – doesn’t really matter to me if it’s December or not. I could watch it over and over again. But during December, it’s definitely more special and gets you into a festive spirit.